The woolly dog bed is complete. The pad was made entirely from an old dog bed and the yarn is 100% British wool out of my stash. The edge includes a separate crocheted section that can be unravelled so the pad can be taken out to allow it to be washed separately from the cover. This was done to avoid the use of buttons, poppers or a zip, all of which might have been rather tempting to chew and then swallow. I am rather pleased with it and Daisy and Sam seem to be happy too. But first I decided to have a go at Poison Oak (not the most promising name, I have to say) with a combination of Cambrian Wool (in Slate) and Little Grey Sheep Stein Fine wool (in Moonlighting). I love the fact that you start at the top and that it’s knitted in the round, so there will be very little finishing required. I’ve just started work on the first sleeve. The wool is gorgeous and the fit is great… what’s not to love? In addition, both these patterns are for asymmetric sweaters, which I think are great for those of us who have real body shapes. Again, this is an approach I’ve never considered before. It’s good to climb out of my knitting rut. So have you tried any new ways of doing anything recently? I had plans for this weekend – some clearing up in the garden, cleaning the interior of the limery and general outdoor sorting out. However, Saturday morning dawned with my nose running like a small stream and frequent fits of sneezing. Plus, outdoors it was raining. So, the garden may still be awaiting my attention, but I’m not so sneezy and I have had a very creative weekend. The wool is a combination of Cambrian Mountains Wool, WoolyKnit Blue faced Leicester and West Yorkshire Spinners Bluefaced Leicester (yes Woolyknit write it as two words and WYS as one). 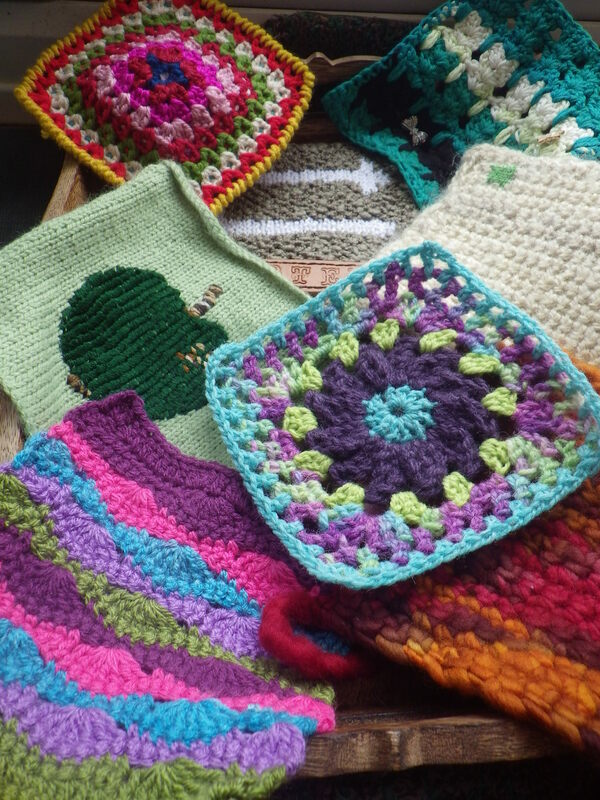 So, thank you Sheepfold for a lovely kit… British wool, fun to make, fabulous colours. I’ve been very busy over the past couple of weeks, mostly working with British wool. In my efforts to buy local, I have become interested in using Welsh wool, but this is easier said than done. You see, here in Britain, we have the Wool Marketing Board and, except in particular circumstances, all wool producers must channel their wool through this organisation. This means that wool produced locally gets muddled up with wool from other parts of the country. 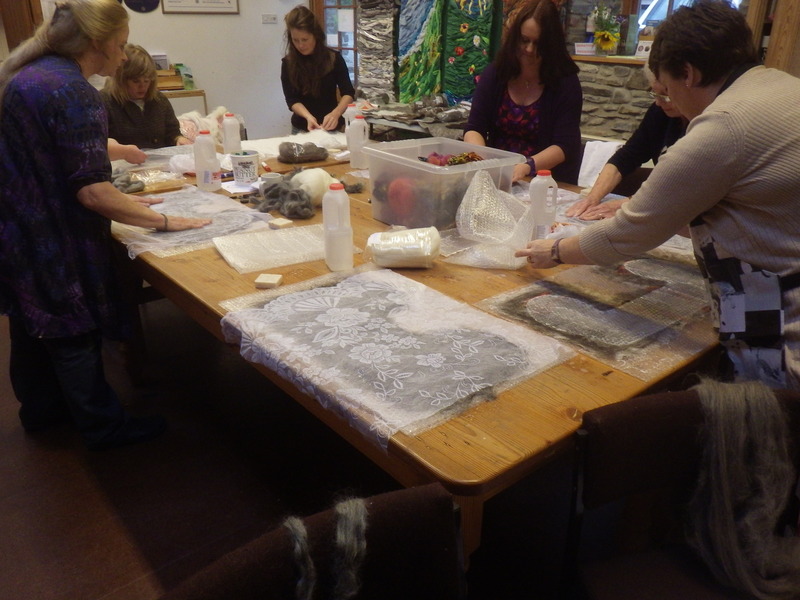 It even means that Falkland Islands wool (which has travelled a very long way around the world) is part of the picture. The only way that you can guarantee exactly where the wool has come from is to buy yarn made from the fleece of a rare breed, because this is kept separate and can be marketed individually. * The problem with rare breed wool is the expense. I have just had to accept that, in most cases, the best I can do is to look for ‘British Wool’. I don’t have any issues with this when I am making things for myself, but it is more of a problem when I’m working on a commission. First, I have customers who specify a particular colour. It’s really easy to get any colour in acrylic yarn and this is what customers have often seen – getting a match in pure wool can be more challenging. Second is the price – acrylic yarn is cheap (for your pocket if not for the environment) and this is a consideration in many cases. And third, lots of people actually don’t like wool – because of the texture, the washing or the fact that it’s from an animal (I have lots of vegan friends who won’t use animal fibres). So, I’m trying to strike a balance – using British Wool where possible and trying to minimise the amount of acrylic I do use. Sometimes some man made fibre is essential: the most robust sock yarn that is also soft is generally 75% wool and 25% man made fibre. In many cases, however, wool is a good choice. 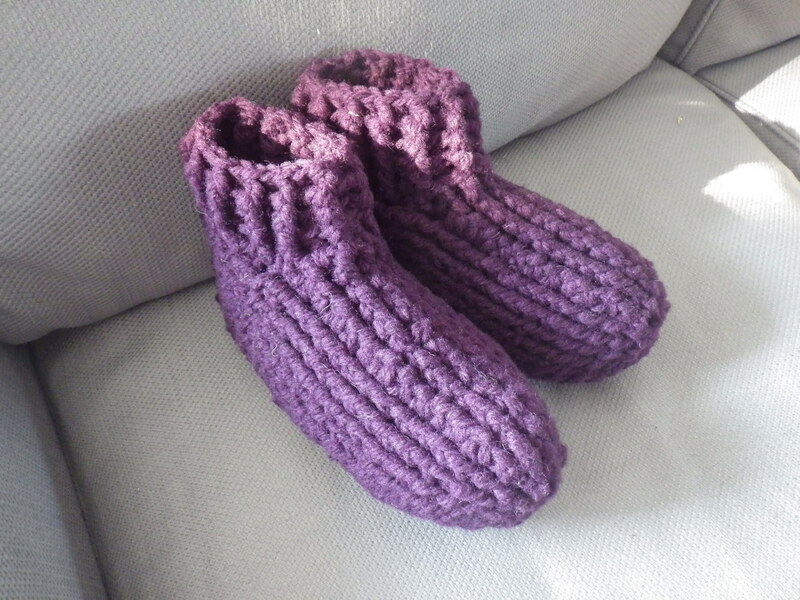 For example, all the crochet slippers I have made recently have made use of hard-wearing, chunky British wool. Plus I’ve been using lovely New Lanark wool for the masterpiece edging and for the cushion cover for my sister. With the leftovers from the latter I have started making an Attic24 stripy bag (the original is in chunky acrylic, but I am using aran wool and adapting the pattern a bit). In addition to the wool I choose, I have realised that when I need buttons, I can avoid plastic and buy ones made from natural materials, or at least use up some from my button box so I’m not buying new plastic ones. And, indeed, I was able to find four lovely buttons in my button box for my sister’s cushion cover… in fact they are antique mother of pearl and much nicer than any I could buy. Perhaps it’s just too easy to toddle of and buy new things when, with a little thought and effort, we can discover exactly what we need at home. I have to go away at the end of the week to undertake some nursing duties. I don’t know how long I’m going to be away, but I want to take plenty of yarn with me to ensure that I will have something to do with my hands for several days at least. If you have been keeping an eye on the Masterpiece page (do take a peek if you haven’t already done so), you will know that I have been a busy bee, creating ‘meditation squares’ – simple patterns that give me something to do with my hands whilst my mind is either relaxing with an audiobook or busily working through an idea or problem – and a few designs of my own allowing me to explore my creativity. It’s been rather nice not to follow a pattern and I am fond of the traditional style of granny square that I make when I don’t want to have to concentrate but I do want to increase my alpha brain waves (it’s true, take a look at this post). 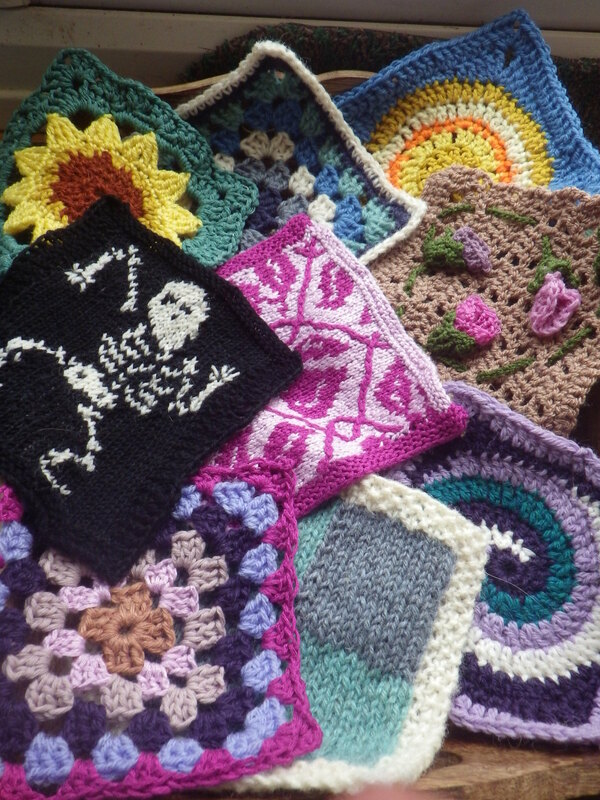 All this means that I have quite a collection of squares now, including the nine that will form the central square of the blanket. Those nine each represent one of the designs in my portfolio… there are ten designs in total, and the complete blanket will represent my learning pathway design. It feels like my trip away will be a good opportunity to start joining them together. My plan is to crochet an edge round each square to ensure that they are all the same finished size and to give a feeling of consistency and then to sew them together… yes I know I could crochet them together, but I like the idea of sewing and I think it will be neater (of course I might change my mind once I start). 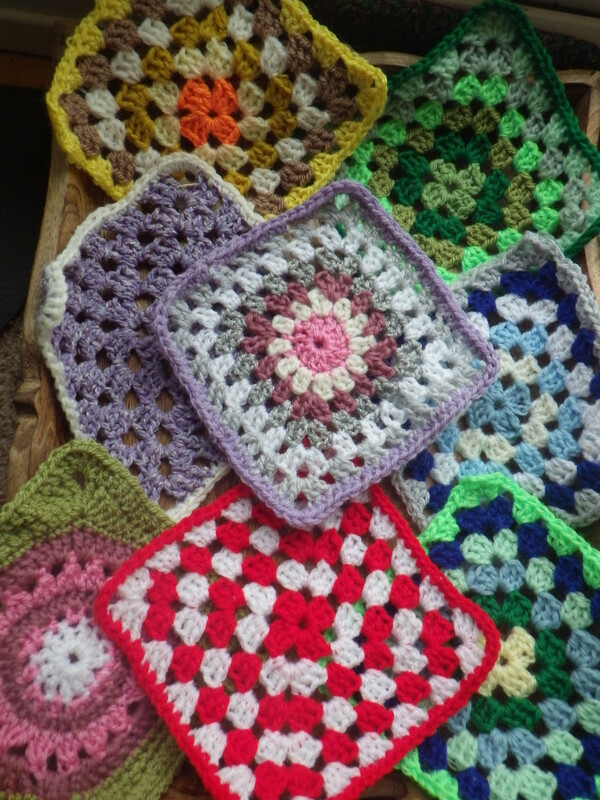 Donated squares… I would still welcome more! And it is at this point that I have had to make the first purchase. I want the borders to all be the same colour and I don’t have enough oddments or wool in my ‘stash’ to achieve this. So, I have had to buy some. 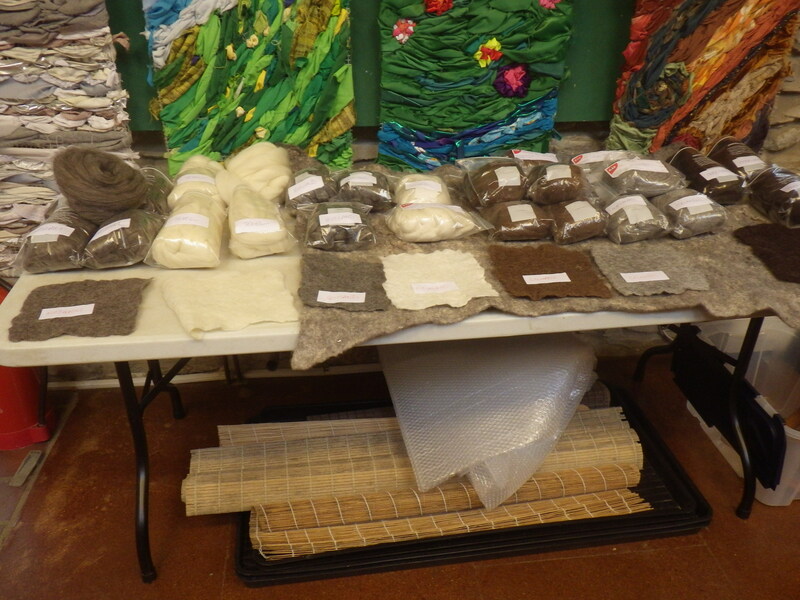 In the spirit of permaculture, I decided to support a small business – I couldn’t find what I wanted locally, so I have ordered some yarn from New Lanark Wool and Textiles. Originally I was going to use black yarn, but I was really taken with the heather shades that they sell, and so I have ordered some in the colour ‘Blueberry’. The wool itself comes from Yorkshire and is processed and spun at New Lanark, which is a World Heritage Site in Scotland. Fingers crossed it arrives before I leave on Friday. If you would still like to make me a square, don’t be put off, I’d love some more. I just think that task of joining them needs to be spread out otherwise it will be too intimidating all at the end! A few weeks ago, as a result of reading the story of how The Snail of Happiness was born, Metan suggested that I might like to create a Germ of an Idea. I produced a prototype soon after, but was not entirely satisfied with the pili (hairs). The answer seemed to be eyelash yarn, but I was reluctant to buy a whole ball without doing a test. 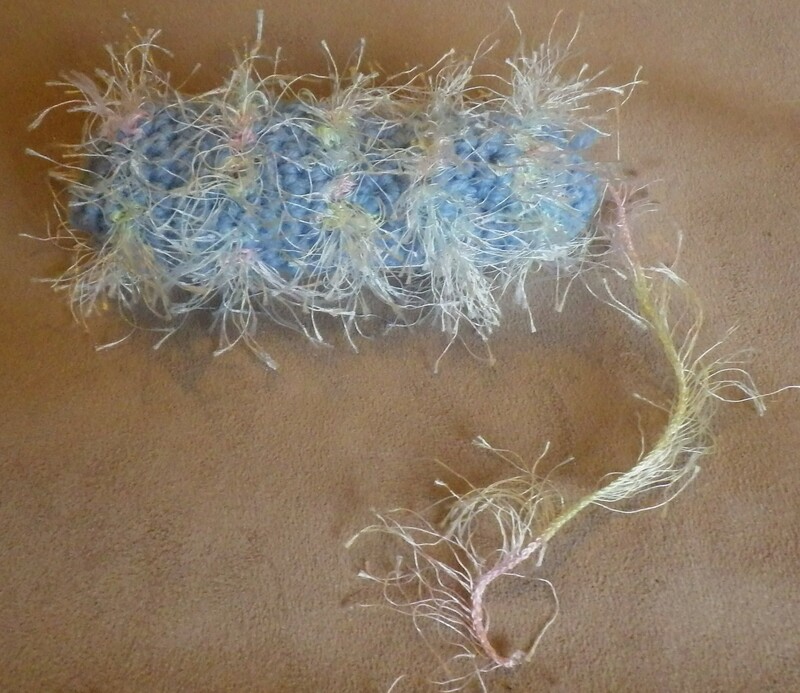 And here, the wonders of social networking came to my aid – a quick message on Facebook and I had two offers – some oddments of eyelash yarn and a couple of balls of a yarn called Filigree. Basically it’s a sausage shape with every third or fourth round crocheted with the eyelash yarn. I will have to take a slightly different approach with the Filigree yarn, as that has a much finer core so will need to be worked at the same time as the main yarn I think. So, do you think there’s a market for them?! I was supposed to be teaching this weekend – a course on land restoration and habitat creation. Sadly, it had to be cancelled and I was left with three empty days, Not that my days are ever really empty, but I was very conscious that some time had appeared that would otherwise have been filled with teaching and I was keen not to let it slip away. 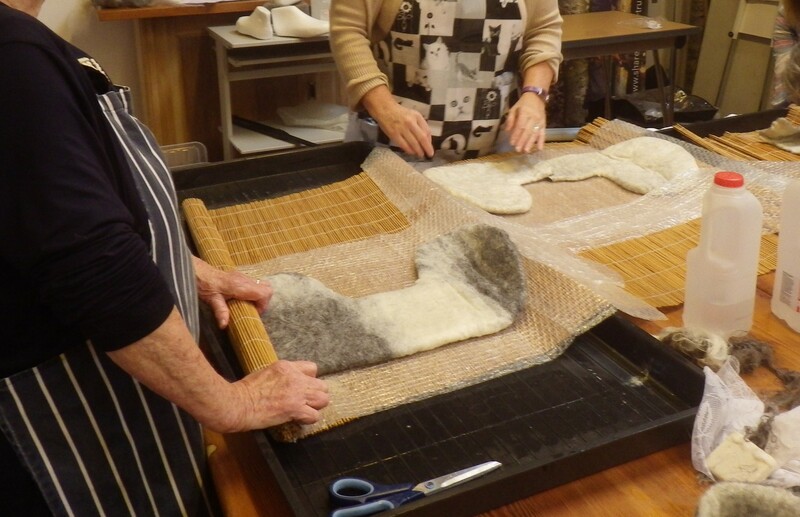 Happily, I got the chance to go on a felting course today… an opportunity too good to miss. 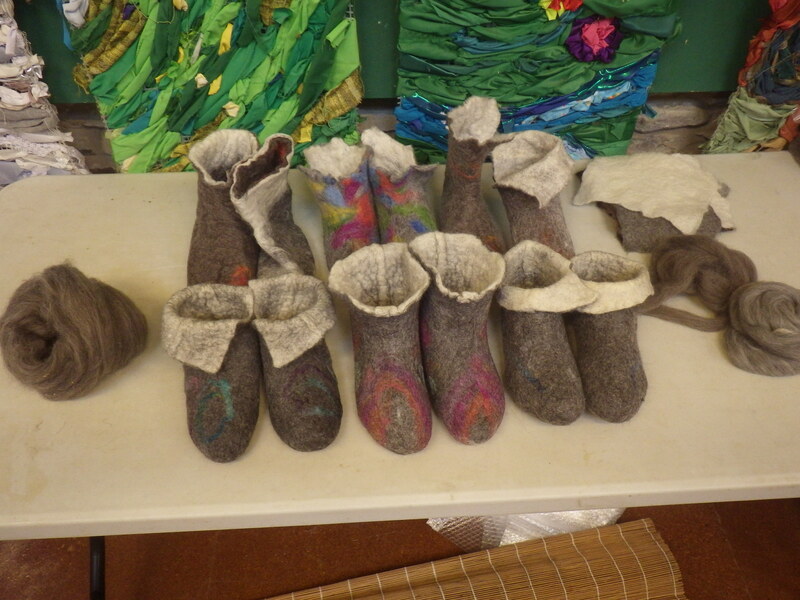 So, I have been making felt slippers at Denmark Farm Conservation Centre with Lorraine Pocklington of Greenweeds. In fact, it’s a course that I have done before, but a girl can never have too many pairs of slippers and I knew that I would really enjoy myself. 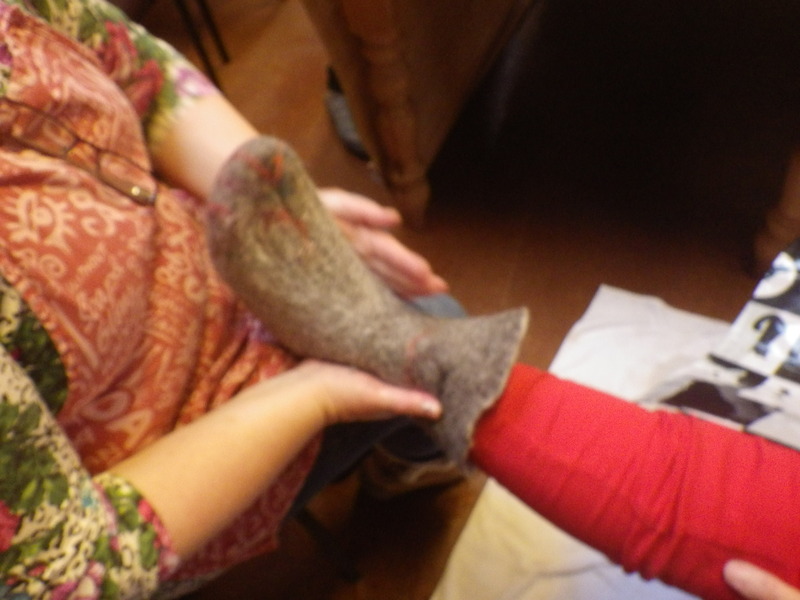 So the day was seized and there’s now a soggy pair of handmade slippers drying in our bath! We started off by selecting the wool that we wanted to use: Masham, Texel, Gotland, Icelandic or Hebridean, all produced in Britain so not many yarn miles! Then we made our resists (the thing that goes in the middle or your felt to stop the two sides sticking together and allowing you to make three-dimensional objects without the need for seams). Once you have a resist, you build up layers of fiber around it, using water and soap and then you begin to felt. 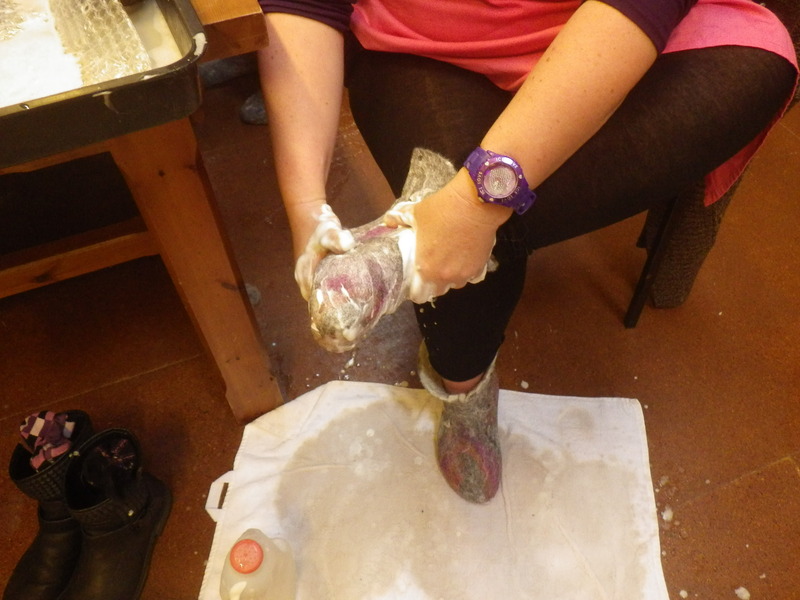 And eventually, you form two slippers and mold them around your feet… or get a friend to do it! Get a friend to help! And at the end of the day, we all ended up with at least one completed slipper! Since I had the advantage of having done the course before, I finished both mine: Gotland exterior, Texel Interior with decorations using some scraps of yarn from Colinette. What a productive and satisfying day.